Sink one in your drink. 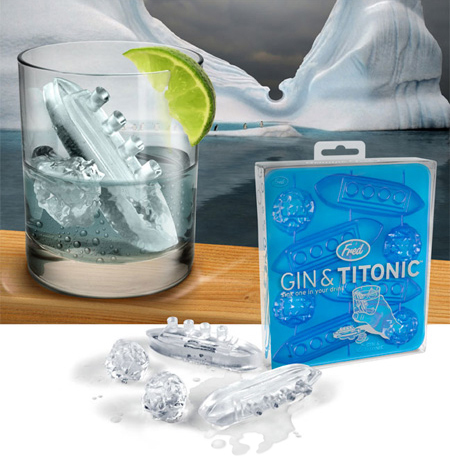 Gin and Titonic ice tray creates Four RMS Titanic ships and four menacing icebergs guaranteed to keep the party afloat. Made of soft recyclable, food-safe synthetic rubber. FunHouse is a set of reusable static-cling decals that turn any mirror into an opportunity to look completely ridiculous. Throw some up in the bathroom, and brush your teeth with a new mustache. Or stick a pair of specs on your rear-view mirror. Wherever you put them, they’ll put a smile on your face. Tabletop magician’s assistant serves up those nifty little sword toothpicks we all love. 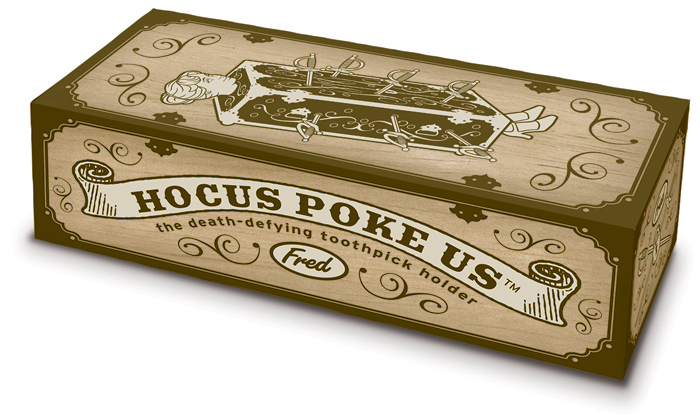 The box magically stores 25 picks inside. Constructed of wood and poly-resin. Packaging design by Christina Sciullo is a must see. Tooth piks stab, spear, scoop and schmear. They’re made of durable, reusable and recyclable plastic. Pack includes twenty-three white teeth, and one gold. Reusable hot packs for your pockets or hands. A chemical reaction creates heat for thirty minutes. Once used, you can boil to re-activate it for use at another time. High intensity, high fashion led key light. Molded diamond surrounds bulb. My aversion to dish washing inspired this fun yet very functional tool. The brush head and handle have built-in bubble wands. Give it a dip in your soapy dish water, and blow your scrubbing blues away. Some disassembly required for this fun, do it yourself placesetting. Reminiscent of those model kits you had as a kid, only without the glue fumes. Setting includes fork, knife, spoon, chopsticks, napkin ring and a handy toothpick. Made of recyclable, reusable plastic. Comes in four colors. Dishwasher safe. Rock on with this retro tote bag made from durable non-woven plastic. Handles are made to look like the tape is unraveling. Boy, I hated when that happened.